When I heard an excited Wowww! escape her mouth, I knew she was likely into something she shouldn't have been. At least she has been watching closely-she did manage to get the mascara in the right general area. Perhaps, she'll have it down a little better and be able to apply without streaking hair and clothes by the time she is thirty. 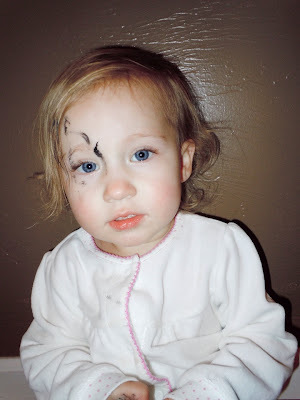 That will be when she's allowed to play with mascara again. How funny! WHat a little stinker!